Every season has its own set of outdoor chores. As we move along in fall, it’s time to start thinking about winter and what needs to go into storage before the cold weather arrives. You’ll no doubt be getting that lawn sprinkler system ready for winter hibernation. One thing that definitely needs to be prepped for winter storage is your lawn mower. Making sure a gas-powered mower is in good working condition will help ensure your mower is ready to one once again when spring rolls around. It’s a good time to check the condition of your mower. · Check the oil and check the spark plug. It’s not a bad idea to replace the spark plug once a year. Doing it before putting the mower in winter storage is also not a bad idea. · About that gas in the tank. Get it out of the tank. Before you put the mower in storage for the winter. Gas that is left in the tank can get stale and gummy, causing damage to the carburetor. Nobody likes damage to the carburetor. Drain the mower in a safe place. Or, add some fuel stabilizer to the gas tank, crank up the mower and let the mower run until the tank is dry. · Drain the oil with a proper receptacle. Replace the oil filter and add new oil. · If you are storing a riding mower, check the air filter to see if it needs to be replaced. · Check for, and tighten, any nuts and bolts that may have come loose during the lawn mowing season. · Check the tire pressure on a riding mower. You don’t want to go get the mower out of storage in the spring and be greeted by a flat tire. 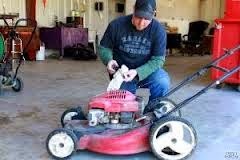 · Clean the undercarriage of the mower. · Charge or remove the battery on a riding mower. These are pretty basic, simple tips. It’s also a good idea to check your owner’s manual to make sure you are not missing anything specific to your mower model.